I had written in my previous two blogs about power of prayer (blog1, blog2) and then in another two blogs about most merciful Tulasi maharani (blog3, blog4). As I experience new realisations they make my faith firm in this most unusual spiritual journey. 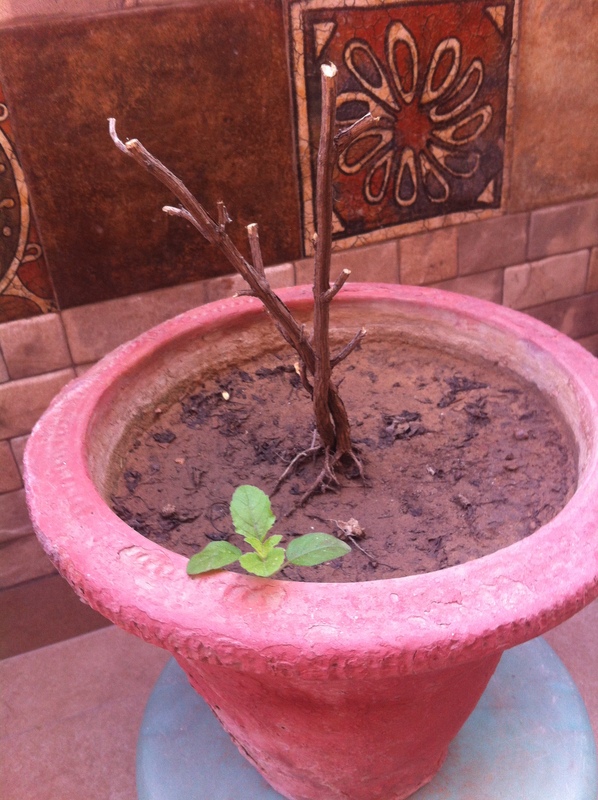 During the last winter, unlike in the past, all the Tulasi Maharanis remained very healthy this year. Unfortunately, Gurgaon had some unseasonal rains after the winter was over and one of the eldest Tulasi could not survive the drastic change in the weather. I kept her in the sun later for many days but to no avail. I felt very sad as I shared a very special relationship with that particular Tulasi and felt very guilty that I did not bring her inside while it rained heavily few days. My wife suggested me to remove the dry stems and we can get a new Tulasi plant. Somehow I didn’t agree to that suggestion, my guilt of not taking good care of her made me keep her as it is. I kept on watering her her daily and prayed her to forgive me for not taking good care in the bad weather and begged her to come back. It’s almost 2 months now, last a week I saw a small green shoot coming out. Initially I thought that it was some wild plant growing on the side but after a few days I knew she has forgiven me as I could clearly see it was Tulasi. She came back ! Here is the picture I clicked today morning. I was so very happy, I was elated. I thanked her profusely and then ran inside to call my children and wife and showed them that how Tulasi maharani listened to my prayers from the and came back. They were surprised as they had seen me watering dry stems since many weeks. Tulasi maharani is indeed the most merciful. Tulasi Maharani Ki Jai ! Madhya 22.125: After item twenty-six (meditation), the twenty-seventh is to serve tulasi, the twenty-eighth is to serve the Vaisnava, the twenty-ninth is to live in Mathura, the birthplace of Lord Krsna, and the thirtieth is to read Srimad-Bhagavatam regularly. SB 3.16.21: Srila Prabhupada writes in the purport ‘The goddess of fortune, Lakṣmī, is sometimes envious of the tulasī leaves which are placed at the lotus feet of the Lord, for they remain fixed there and do not move, whereas Lakṣmījī, although stationed by the chest of the Lord, sometimes has to please other devotees who pray for her favor’. O Vrinda-devi, O protectress of the moving and non-moving living entities in Vrindavana, you are wealthy in the mercy of the Divine Couple who enjoy pastimes in Vraja. Please be merciful to me. 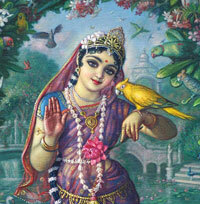 Please place me among Sri Radha’s associates. O Srimati Tulasi-devi, O celestial Ganges river of mercy, it is because I once placed my head at your lotus feet and drank some drops of water that washed your lotus feet, that these desires have risen in my heart. O Srimati Tulasi-devi, how low I am, my heart pierced by hundreds of offenses! How exalted and difficult to attain is my aspiration! Your causeless mercy is my only hope. It is by Your mercy that I, who am so fallen, can have these desires in my thoughts. All glories to Tulsai maharani. This entry was posted in My realisations, My spiritual Journey and tagged care of tulasi, love of Tulasi maharani, mercy of Tulasi maharani., Pray to Tulasi Maharani, prayers to Tulasi maharani, Tulasi Maharani. Bookmark the permalink. ← What is success in our spiritual life ? Question: Is Tulasi one soul or multiple souls? Thank you for reading this shudra’s blog and leaving a comment. Your question is very deep and I am not qualified to answer it. You may need to ask this question to a senior Vaishanava for clarity and then share the answer with us as well. Still, my little understanding is that Tulasi Maharani’s body is spiritual and although she appears as many individual plants, she is one person. Hare Krishna Prabhuji. Dandavat Pranam. PAMHO. AGTSP and AGTBCS. This is so wonderful and shows the power of pure devotion and pristine desires. I am sure this will motivate many devotees to pray more diligently to Tulsi Maharani just as it has inspired me to do the same from tomorrow onwards. Thank you so much for sharing this wonderful experience, you are truly a wonderful gift from Guru Maharaj whose causeless mercy is helping me to get this wonderful association. When I was writing this blog I knew somewhere inside I may be getting sense gratification by sharing with devotees how my prayers got answered. Then I thought, still, let me share with devotees as actually it is for the glorification of Tulasi Maharani. And I thought about it I realised that the power lies in her mercy and not in my prayer. All glories to Tulasi Maharani. THULASI MAHARANI KI JAI !!!!!!! I HAVE REALIZED CHANTING IN FRONT OF THULASI MAHARANI INCREASES CONCENTRATION AND TASTE TOWARDS CHANTING FOR A LONG TIME !!!! !